Gabriel Agbonlahor will not play for Aston Villa while the Premier League club carries out an internal investigation into his conduct. 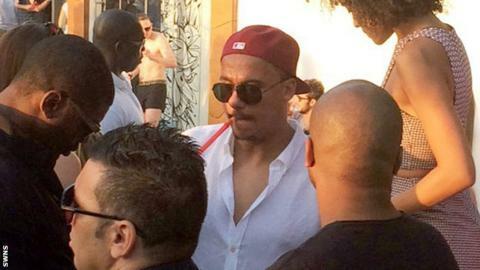 The forward was pictured appearing to hold a shisha pipe while on holiday in Dubai during the international break. Agbonlahor, 29, will miss Saturday's game against Chelsea at Villa Park. Caretaker boss Eric Black said he took the decision to remove Agbonlahor from the squad because he did not want anything to "distract the players". He added: "I'll speak to him again on Monday and then we'll take it from there. He's back in and reporting for training. "I'm not going to go into the details because the investigation is on going. I want us to get back to football and football alone." Black is in temporary charge of Villa after Remi Garde left the club by mutual consent on Tuesday after 147 days in charge. Villa are 12 points adrift of safety with seven games remaining. Former Leicester boss Nigel Pearson and ex-Manchester United and Everton manager David Moyes are among the names being tipped to replace Frenchman Garde, who won just two league games while in charge. The disconnect between Villa fans and players is now tangible, with the supporters ranging from resigned to angry. Agbonlahor's suspension is designed to reduce the hostility towards the players that may surface at some stage during Saturday's home game against Chelsea. Although Agbonlahor did nothing illegal in Dubai, many Villa fans are angry at his decision to relax in such a way, with the season so close to an end.